Micro-Macrame beads come in many styles, shapes and sizes. This page describes some of the most common types you can purchase, either online or in craft stores. Since Micro-Macrame features cord material 0.75mm to 2mm, you have a lot more options when choosing beads. Metal, plastic, wood, glass, ceramic, and gemstone beads are described on this page. There are also beading tips to help you find the right beads for your projects. 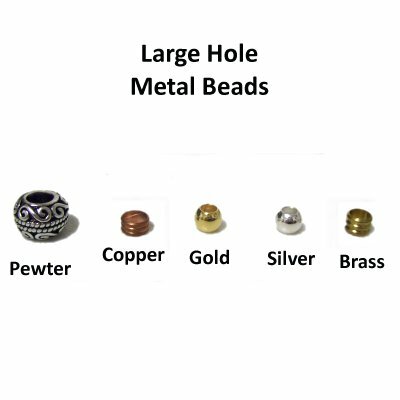 When purchasing beads, the hole size is not the only feature you need to consider. The overall size and the weight are just as important. So is the price. For each type of bead listed below, I've provided information on these topics. 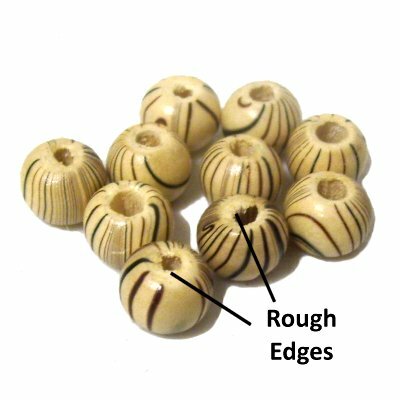 Beads suitable for materials over 2mm wide are described on a separate page, called Macrame Beads. Click on the link to visit that page, if you haven't already been there. Some of the most popular Micro-Macrame beads are made from metal, which includes silver, brass, gold, copper, aluminum, or pewter materials. Brass beads can have a silver, gold, or gunmetal finish. They won't be as expensive as real gold and silver will be. Pewter isn't as shiny, but the beads often have unique designs. Aluminum and copper beads are harder to find than the other materials. Metal beads range in size from 4mm to 20mm, but focal beads can be as much as 50mm in size. Basic shapes (round, oval, etc.) are sometimes called "spacers", because they are used to separate patterns on beaded jewelry. When purchasing metal beads, keep in mind that the weight increases with size. In the image below, the pewter bead on the far left was much heavier than the other beads. The type of material also affects the weight. Aluminum is the lightest material, while Brass and Pewter can be quite heavy. These metal beads all have holes 4mm - 5mm in size. Large holes are great if you have several cords to pass through the beads, such as when you make bead clasps. When passing single pieces of cord material through Micro-Macrame beads, you may need small holes. Filigree beads usually have tiny holes suitable for a 0.75mm to 1mm cord to pass through. Beading Tip 1: It's important that the hole size fits the material you are using. Micro-Macrame beads can tilt or turn if they don't grip the cord material adequately. Determine how many cords will pass through each bead. Multiply the number of cords X their width (1mm, 2mm, etc.). The result is the hole size you need for the material you are using. Focal beads are usually 25mm or larger, and are used to attract the eye (focal point) in a bead design. 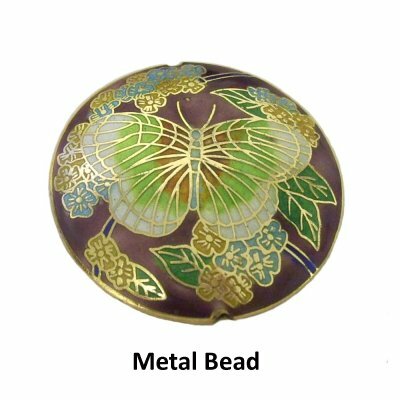 This Cloisonne' bead is 45mm in size. Cloisonne' is a technique where colored glass or enamel paste is used to create elaborate designs on metal beads. Very fine wire is often used in the process of creating these designs. Many of these Micro-Macrame beads are hand made and truly unique. Because so much time and effort goes into these beads, they cost more. 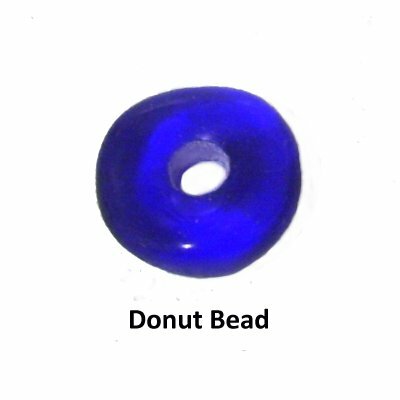 The hole size is usually 1mm to 1.5mm, even if the bead is large. These beads are often hollow, which makes threading them a challenge. Beading Tip 2: When preparing cords for Micro-Macrame projects, you can cut the cords a little longer, then apply glue to the tips. Cover at least a 1-inch area at each end. This will stiffen the material and make beading easier. Wire beads are a unique way to decorate your handcrafted jewelry. Sometimes they have holes in the center (blue bead). Others have spaces through the wire loops, so can dangle like charms (silver bead). 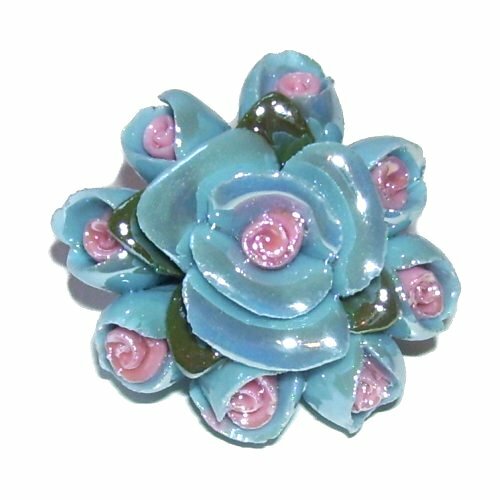 Great for earrings! 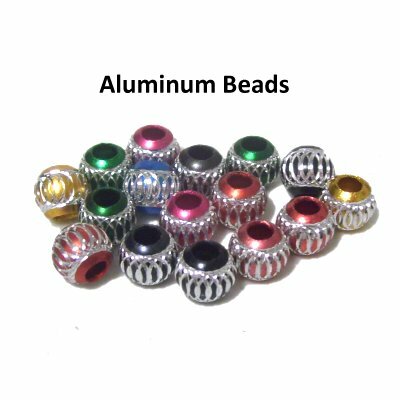 Aluminum Beads are also unique, and sometimes come in non-metallic colors. These are very lightweight, so are an excellent choice for earrings. EBAY is a good place to find interesting beads, which is where I found these. Micro-Macrame beads can sometimes be expensive. I've seen beads priced at over $20.00 each. For many people, the price can often make the decision for you. The least expensive beads are those made with plastic (or acrylic) materials. They have the reputation as being too plain, but you can find unique styles. Wood beads also have low prices, and you are often able to enlarge the holes with a bead reamer. 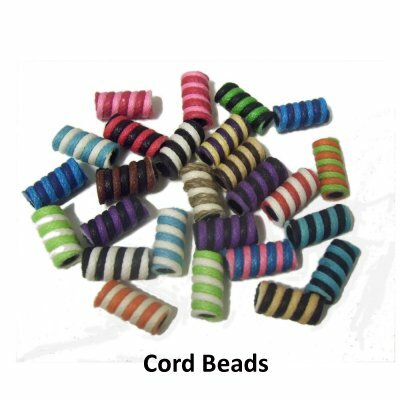 Cord beads have either a plastic or wood base that is wrapped with cord material. Some have crochet or woven fabric surrounding the base. They are lightweight and very inexpensive, making them a great choice for children's projects. Wood beads are also a good option for children's projects, since they are often brightly colored and inexpensive. The hole sizes for plastic and wood beads are usually 2mm - 3mm. Beading Tip 3: When working with wood beads, inspect them for rough edges, which is common. Use a bead reamer to clean up the inside and edges, or to enlarge the holes. Also, keep them away from heat sources and windows, since the varnish can melt or become sticky. 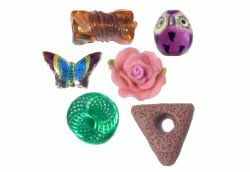 Both plastic and wood beads come in a huge variety of shapes and sizes. 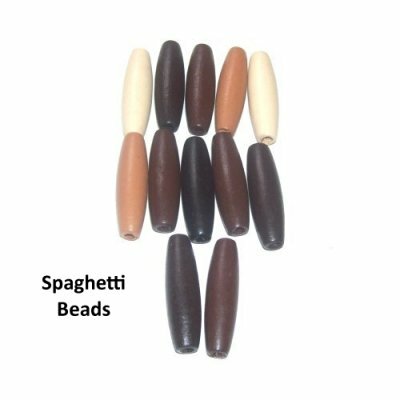 These Micro-Macrame beads are called Spaghetti beads, because they are long and narrow. 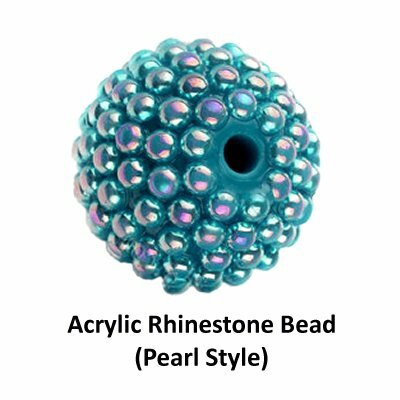 Acrylic Rhinestone beads have molded stones or pearls that sparkle and shine. Some styles are called "Disco Ball Beads". These cost a lot less than beads made with glass rhinestones. 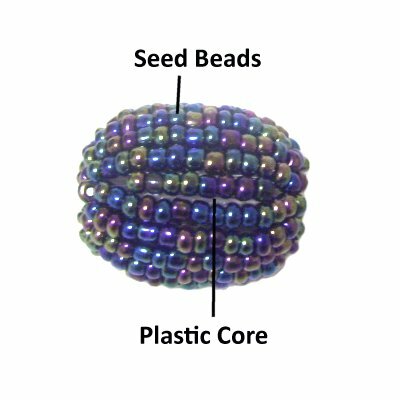 This interesting "Beaded" bead has a plastic core that is covered with rows of glass seed beads. This one is 25mm, so is the right size for a focal bead. Plastic shank style buttons can be used in the same way as Micro-Macrame beads. Novelty buttons come in a variety of unique and appealing shapes. Standard round buttons are used with loops, or the Buttonhole Clasp. Ceramic Micro-Macrame beads are another popular type used for jewelry. I've included Stone beads as well as Clay beads in this section, too. They range in size from 5mm to 25mm, and are usually inexpensive. 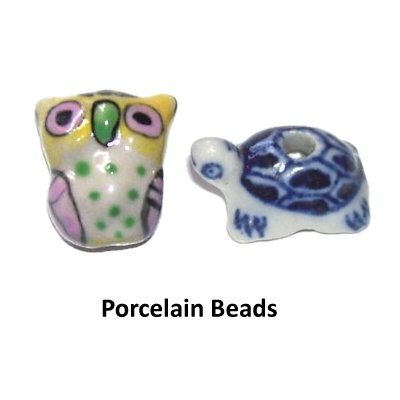 Porcelain beads are made from ceramic materials, and are often very shiny and colorful. They come in basic shapes as well as figures. The hole sizes are usually 1mm to 3mm. These beads are easy to find, but you will find the most unique shapes in online stores. Ceramic Beads are often chosen for their excellent details. Micro-Macrame beads like this flower are usually very realistic. Peruvian ceramic material was used to make this figure bead. 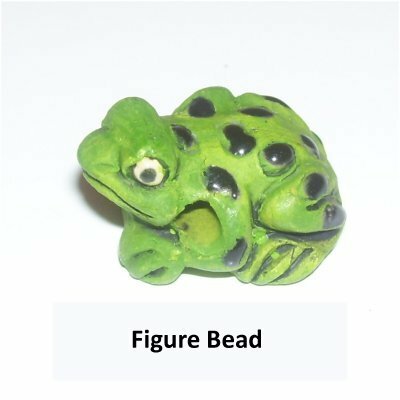 The frog looks realistic, and is not as glossy as regular ceramic or porcelain. Shipwreck Beads has a nice selection. 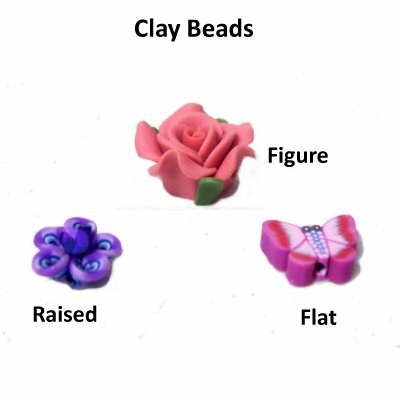 Clay Beads are some of the most colorful beads you can find. They come in a huge range of styles, sizes and shapes. The three most common styles are shown here. The hole size is usually 1mm to 2mm. Stone beads can be really unique. 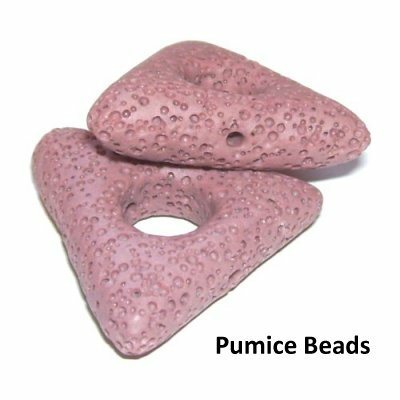 These are Pumice beads (Lava beads). They are interesting because you can feel and see the texture of the stone. You can find stone beads in most of the basic geometric shapes. The hole size is usually 1mm to 2mm, depending on the overall size (4mm to 25mm). 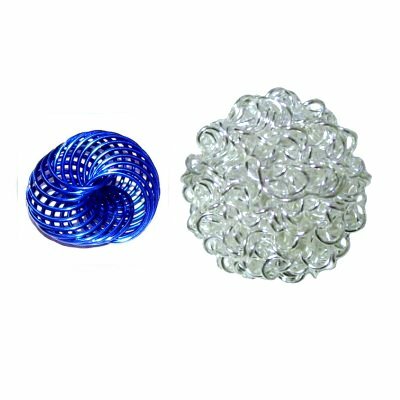 The most common Micro-Macrame beads are those made with glass. The information below tells you about the most popular types, but that is only a small fraction of the many styles and shapes available. The sizes range from less than 2mm, all the way up to 25mm. There are larger glass beads available, but they are hard to find. 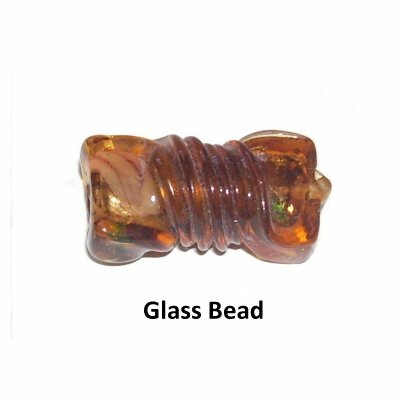 There are hundreds of online stores that carry glass beads, and you can usually find them in craft stores, too. Beading Tip 4: Before searching online, do some research to see what types, shapes, and sizes you may want to purchase. There are so many options, you need to narrow the search and look specifically for what you want. Example: You can type in a search engine "6mm teardrop glass faceted crystal beads 1mm hole". That will bring you to an assortment of online stores to search through. Seed beads are the smallest Micro-Macrame beads you can purchase. They come in a variety of shapes, styles, and sizes. The most common are Rocailles, which are round. Rondelles are shorter and more compressed. 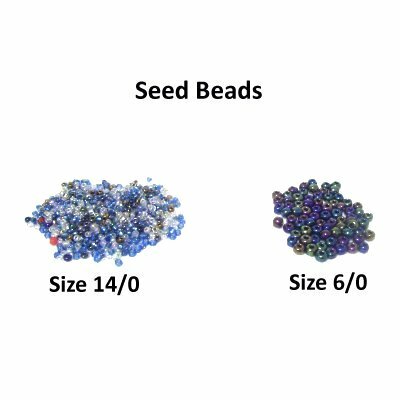 This Seed and Bugle bead chart from Shipwreck Beads will help you understand the various sizes and shapes. 14/0 = 1.6mm with 0.4mm holes. 13/0 = 1.7mm with 0.5mm holes. 11/0 = 2.1mm with 0.7mm holes. Bugle Beads: Tubular seed beads that are sized by length. Sizes 2 and 3 are similar to size 11/0 Rocaille beads. Hex-cut: Beads with six sides (hexagon). Faceted: Beads with multiple flat surfaces. Miyuki, Toho, Matsuno: High quality seed beads made in Japan. 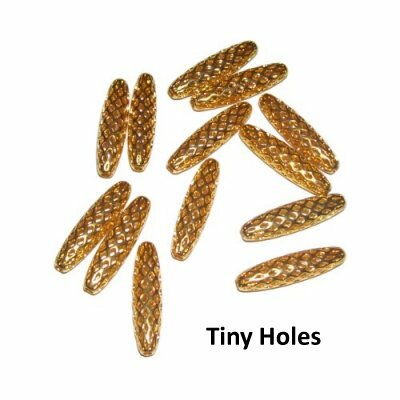 Delica: Cylinder seed beads made in Japan that have thin walls and large holes. These beads are often used for bead weaving. The sizes are slightly smaller than round beads. Pressed Glass: These beads are made by pressing glass onto a mold. Many interesting shapes can be created. Imprints can be added with a contrasting color. 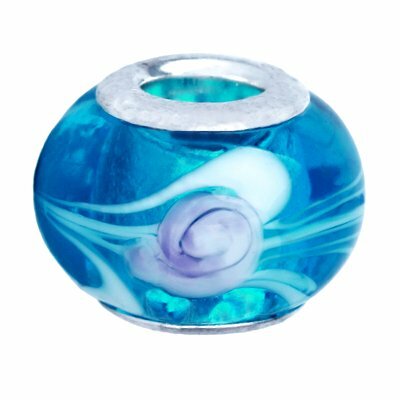 Blown Glass: These hollow beads are made by blowing into a glass tube onto melted glass, which is then shaped by heat from a flame. Murano beads are often made with blown glas. Lamp work beads: These are often handmade. The glass is first melted, then wrapped around a wire while it's hot, creating the hole. Often highly decorated, these are some of the most beautiful beads you can purchase. Crystals: Beads made with glass mixed with Lead. This process was invented in the 1600's. Swarovski Austrian crystals are the most common brand, and are usually faceted with a high shine. Fire polished: These beads are sometimes called crystals due to their facets and high shine, but do not contain lead. They are cut by hand or machine, then heated to smooth the edges. They often have some type of finish, too. Czech beads are often fire polished. Milliefiori = Means "thousand flowers". First developed in the 1800s. Thin rods of glass in different colors are fused, then cut in cross section slices. The slices are then melted over a glass core. Glass beads sometimes have unique shapes, like this one, which looks like a bow tie. Hearts, figures, flowers, cubes, triangles are examples of non-basic shapes. 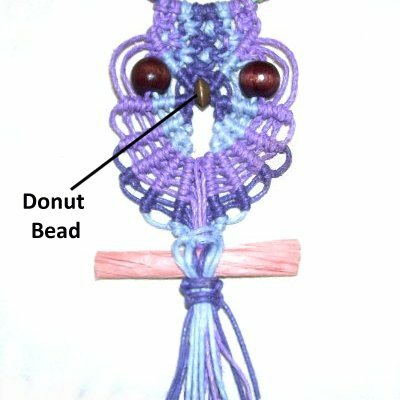 I used to think Donut shaped beads were not suitable for Micro-Macrame, but I have since changed my attitude. You and pass the cord through them horizontally, vertically, or have them dangle like a charm. In this image of the Owl Pendant, the beak was made with a donut shaped wood bead arranged vertically. 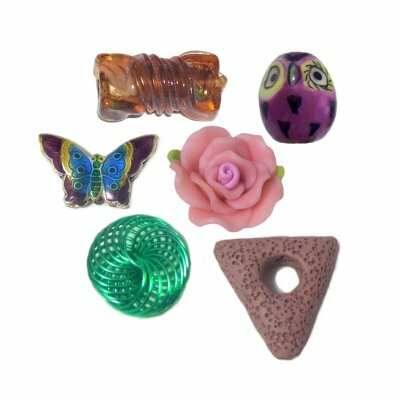 Crow Rollers are a popular type of glass bead that can be used in Micro-Macrame, as well as projects made with thicker materials. I use them when I make beaded fringe with 4mm size material. 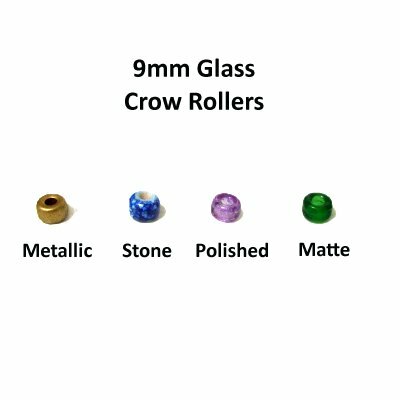 Crow Rollers are simply round, short beads with large holes. The beads shown above have different styles and finishes. They are 9mm in size with 4mm holes, which is the most common size. 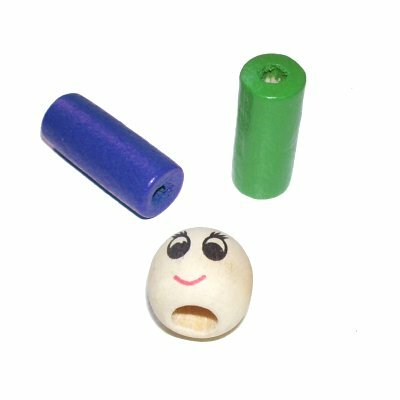 Crow Rollers made with plastic are sometimes called "Pony Beads". 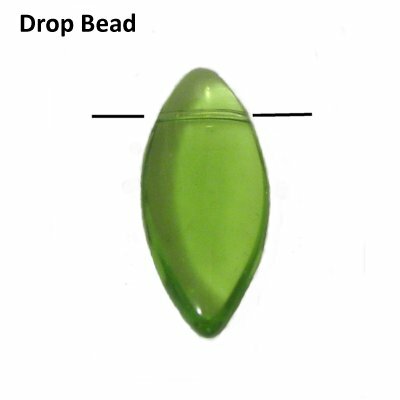 Drop beads are unique in the fact that the hole is horizontal and placed near the top. So they dangle like charms and pendants. Unfortunately, it's hard to find drop beads that have hole sizes over 1mm. European Beads are extremely popular. They are sometimes called Pandora Beads. The ones made with glass have a silver or gold grommet lining the hole, which is usually 5mm. These beads are often highly artistic. Handmade beads in this style are usually expensive. Rhinestone beads are also very popular. 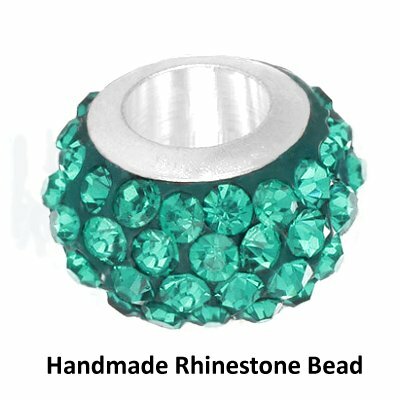 This is a handmade European style bead that's been covered with glass Rhinestones. 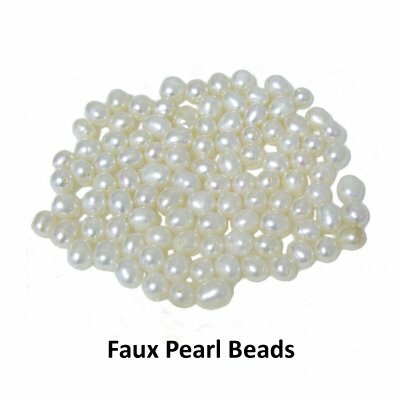 Faux Pearls are oval shaped glass beads that have a glossy coating, so they resemble real pearls. You can tell the difference by the fact that the beads will be all the same size. 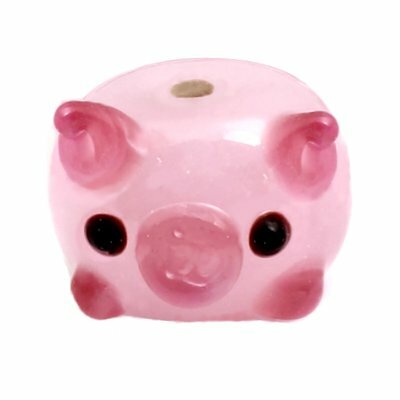 Figure Beads made with glass often have raised areas that stand out, like the ears, nose and feet of this little piggy. Basic shapes can have raised areas and textures, too. Have any comments about Micro-Macrame Beads? Contact Me.